Do you make Valentine’s Day cookies? How many do you make for each person? Several years ago, I started making big cookies … one for each person. My guys have always been impressed by big food … pancakes that are big as the plate, huge lollipops (like the one’s from amusement parks), huge baked potatoes, double or triple burgers and jumbo cookies. Today’s cookie is a big version of yesterday’s recipe … Peanut Butter Chocolate Chip Cookies. I went big … not just in size … more peanut butter and chocolate, by adding a Reese’s Peanut Butter Cup! These are my Jumbo Valentine Cookies! 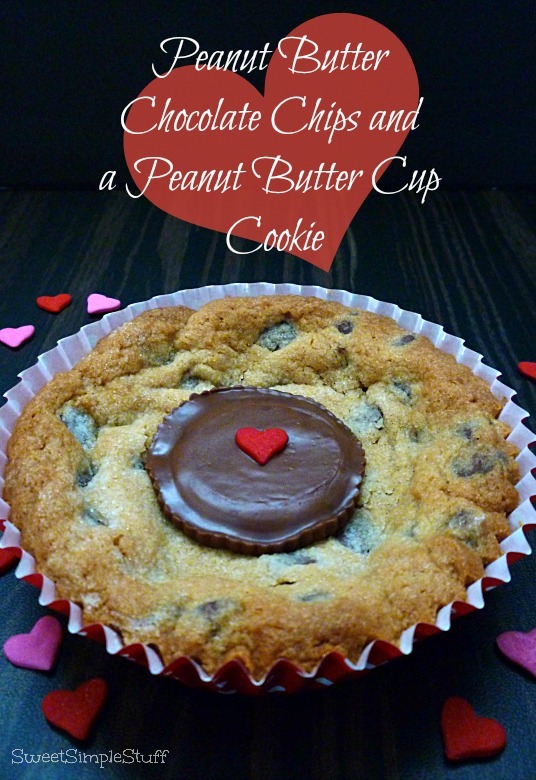 I used the same idea as Peanut Butter Blossom Cookies … baked the cookie, then inserted the Peanut Butter Cup. The chocolate melted slightly … the heart sprinkle/decoration stuck! 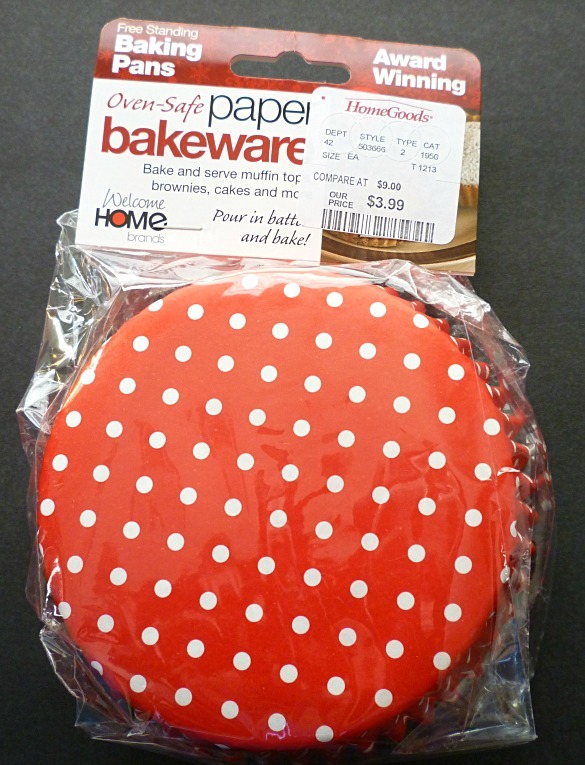 The paper cups made baking these cookies especially easy, plus they are red with white polka dots … love polka dots … found them at Home Goods, but I’ve seen them at other stores too. The size is 4″ x 1-1/8″ … a mini pot pie pan would be a good substitute. This is how you do it … make the Peanut Butter Chocolate Chip Cookie dough from yesterday’s post. 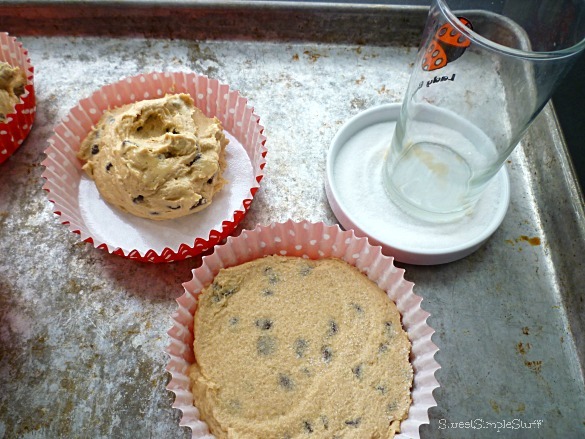 Put enough dough in the cups to fill them about half way … flatten with a glass dipped in sugar. The recipe makes 10-12 jumbo cookies. Bake in a 375°F oven for about 15 minutes or until golden brown. While the cookies are baking, remove Snack Size Reese’s Peanut Butter Cups from their wrappers. 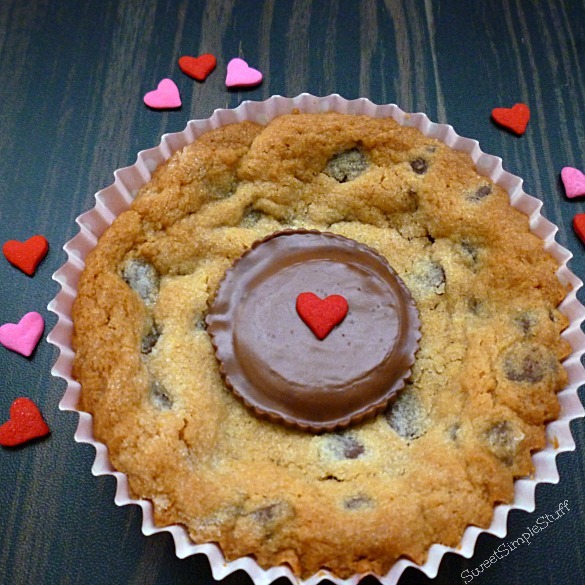 Remove cookies from oven and insert the PB cups immediately, add a cute heart when the chocolate is slightly melted! Is your Valentine a cookie lover? These are absolutely Adorable and how I love the chocolate in the center and that cute little heart. So sweet. I don’t normally make Valentine cookies anymore. I used to when our daughters where younger and still at home. I do have a Wilton pan that I can use for making large cookies. I may just have to make some for my dear hubby for Valentines Day even tho he will be working. Thank you Colleen 😉 I bet your hubby will be a happy hubby when he get home from work!!! Just looking at these make my mouth water for some of these yummy cookies. Looks easy peasy, as you say, to make. Brenda, I’m nibbling on (scarfing down!) Peanut Butter Blossoms that I just took out of the oven. 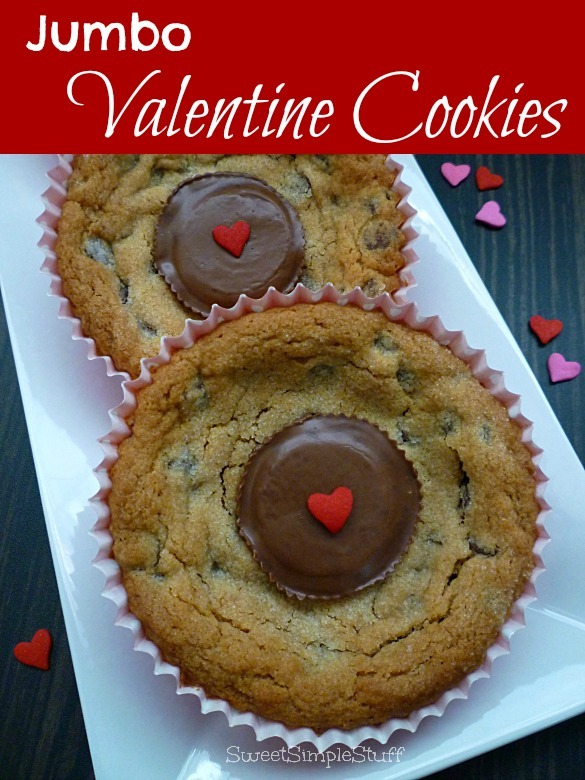 You nibble on your Jumbo Valentine Cookies and we’ll happily gain weight together!! Too funny Kathleen 🙂 Gaining weight is something I’m good at, LOL! Now that’s my kind of cookie and I’m sure you needed one after the day you had. I hope everything with the car is resolved soon. Waiting in a parking lot for 2 hours could not have been fun! Thank you Beth 😉 A cookie would have been nice … settled for pizza … no cooking dinner after that day! The car is fixed … waiting 2 hours … frustrating! Thanks Trish 🙂 The cookies are not exactly “bite-size”, but “many bites size”! You should have had 1 (or 2 🙂 of these to munch on yest. when your car wouldn’t start. PB & Chocolate makes everything better. To pay for roadside and then to be LEFT on the roadside for that long is just not right! Thanks for mentioning the size of the paper cups and also for listing how many it makes. Things always look bigger on internet photos so knowing the dimensions we can now guage how many to make. I wouldn’t trust myself with a 4″ cookie but could give one to a couple, wrapped up real nice, as a little Happy Valentines Day instead of a card. For other holidays, just change the sprinkle. Tavette … I couldn’t agree more! I am going to make a complaint, but I must say that the person that answered my call was very nice … asked if I was in a safe place … did I need police assitance, etc. It was frustrating … sitting and waiting … couldn’t leave the car … thankful that I didn’t need the restroom, lol … but, I could have been shopping!!! Brenda, looks SO delicious and the chocolate in the middle – a perfect middle!!!! Thank you Dinaz 😉 Chocolate is always perfect! What a delicious treat! This cookie combines everything I love..Pinned! Thank you Sue 😉 Cars … you got that right!